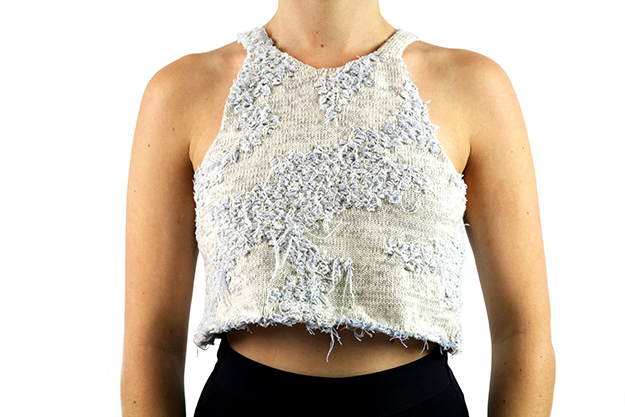 Claire Blaby is an emerging Melbourne based textile designer. With a passion for constructed textiles, Claire’s design work emphasises experimentation with materials through knit and woven outcomes. Claire also dabbles in hand-generated print design, finding inspiration from natural surroundings and the small, often overlooked details of the everyday. Throughout her textile design studies, Claire has had experience working with established Australian brands such as Country Road, Linen House and Maxwell & Williams. She was awarded the Designer Choice Award from Country Road and recently had work exhibited in New York as a finalist for Trend Tablet’s inaugural ‘Dorothy Waxman Textile Prize’. Claire is always aiming to diversify and explore her creative practice, looking to travel in the future and collaborate with various creators and artists as well as continuing to develop her own ‘handwriting’. The BA Textile Design (BATD) program equips students with the knowledge and skills to be internationally attuned creative textile designers with the capacity to work across a range of industries and fields. A key focus of the program is the immersive and engaged studio experience, enabling students to develop innovative design concepts and material outcomes. Students work with leading academics on commercial and conceptual projects that explore the diversity of textile design practice. Projects with key industry partners provide the opportunity to participate in real-life placements with a range of high profile creative enterprises in the local and global textile industries.